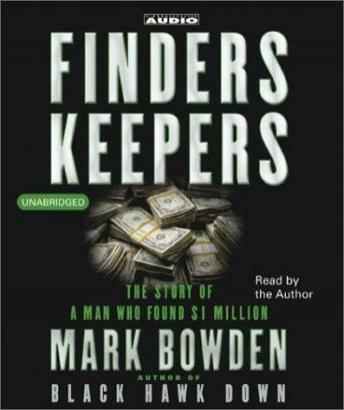 By one of our most evocative and versatile chroniclers of American life, Finders Keepers is not only a gripping true life thriller, it is the remarkable tale of an ordinary man faced with an extraordinary dilemma, and the fascinating reactions -- from complicity to concern to betrayal -- of the friends, family, and neighbors to whom he turns. Finders Keepers is a tale of the greed we all hold secret in our hearts. It focuses on real-life protagonist Joey Coyle, who finds $1.2 million dropped from an armored car in the early 70's. The author takes us into Joey's blue collar South Philadelphia, where we come to know Joey as a man full of self-loathing, who's chronically unemployable, and frequently high on drugs and alcohol. The second half of the book is darker, even tragic, as we watch Joey and his cronies slowly but inexorably sabotage his dreams of "being a big coke dealer or opening a body shop" with the purloined money. The ending is unexpected, and disturbing because, after all of this, Joey is a pretty likable character as screw-ups go. Excellently read by the author, I highly recommend this piece of offbeat Americana. A Philly crackhead finds a million. What to do? What to do? Mark Bowden once again writes a tight story. Good job. Jumped around a lot and was kind of boring. I kept waiting for something great to happen. This book was very dark to me. Because this is based on a true story I stayed with it until the end. It depressed me how this man's lifestyle was. Over all it was ok. In enjoyed this fascinating tale. I was surprised to hear the author tell his story of marketing the story and helping to make it into a movie. I really enjoyed the book and the story, but the stupidity of Joey was amazing. This hit got an amazingly lucky break and screwed it all up. Quite a comedy of errors! Good book. It was slow at some parts, but the narrator is very good to listen to. I found this audiobook to be odd. It didn't really seem like a story but more like a timeline. It was read by the author himself and after listening I was completely unaware it was based on a true story that was later turned into a movie starring John Cusack.